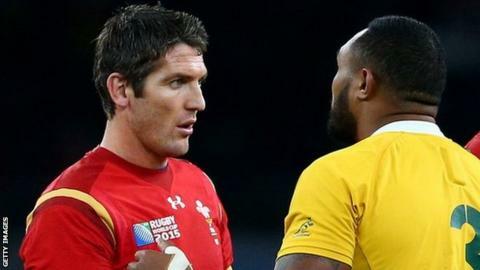 Wales legends Jonathan Davies and Martyn Williams have backed James Hook to start at centre against South Africa in their World Cup quarter-final. The call came after the latest injury blow among Wales' backs as Liam Williams (foot) was ruled out. Ex-Wales fly-half Davies said: "This is an all-or-nothing game and he [Hook] might offer something different." Former Wales flanker Williams says Wales will not fear South Africa, adding they need Hook's X-factor. Liam Williams suffered a recurrence of a foot injury in the Pool A decider defeat by Australia that set up Wales' game against the Springboks. "If you're going to beat South Africa, probably, you will need that little bit of X-factor, that little bit of magic," said Martyn Williams. "You won't out-muscle them so needs must." Only one of the outside centres to have played alongside James Roberts in Wales' midfield in the tournament remains fit - twice capped 20-year-old Newport Gwent Dragon Tyler Morgan. Gloucester's Hook, at 30, has made 80 Wales appearances at fly-half, centre or full-back and also toured South Africa with the 2009 British and Irish Lions. The former Osprey was omitted from Wales' initial tournament squad, but recalled amid their run of injuries. Roberts' most regular centre partner, Jonathan Davies, was ruled out in May while Scott Williams and Cory Allen broke down during their successful bid to reach the knock-out stages from Pool A.
Davies says now is not the time for Wales coach Warren Gatland to discover whether Dragon Morgan can rise to the challenge of facing South Africa. "Tyler Morgan is one for the future. He's had one [tournament] game already - it's a big game against the South Africans. "And you know what they're going to do. "I think we need to think differently now and Jamie [Roberts] and Hooky can play left and right. "James can kick, Jamie can take it up the middle. "James Hook's distribution is a little bit better so I would play him at 12 and swap them back and fore." Back-row: Dan Lydiate or Justin Tipuric? Williams says there is room for both men in the match-day squad with Lydiate returning at Twickenham on Saturday. "Lydiate always plays well against South Africa - he probably invented the chop tackle four years ago in the opening game [of the 2011 tournament against the Boks]. "And he brings that physicality. "Justin can come off the bench and do what he does best. "He's been brilliant off the bench and Dan Lydiate was brilliant against Fiji and England… and this game is tailor-made for him." Williams says Wales' efforts against South Africa under Gatland have ensured they will not be fazed against a nation they have beaten only twice. "You know what's going to happen - they're going to come straight at us. "And they love the physicality, the Welsh boys. Gatland's game plan does fairly well against them. "We won in the autumn [of 2014], the Lions did well in '09 [when Gatland was an assistant coach] and Wales should have won the second Test in South Africa [in the summer of 2014]. "So they won't fear the Springboks - they know they can beat them."